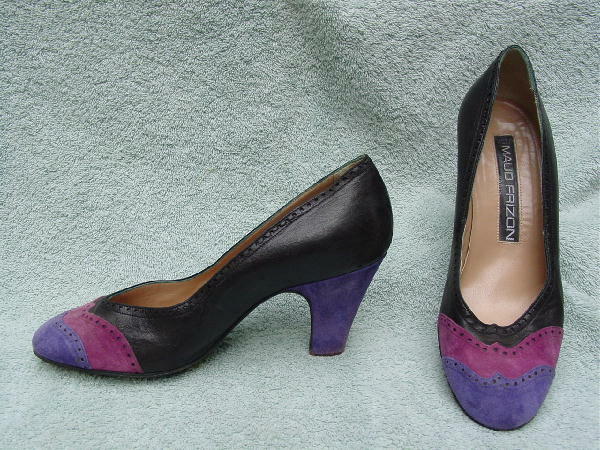 These vintage rounded toe leather pumps are by Maud Frizon Paris. 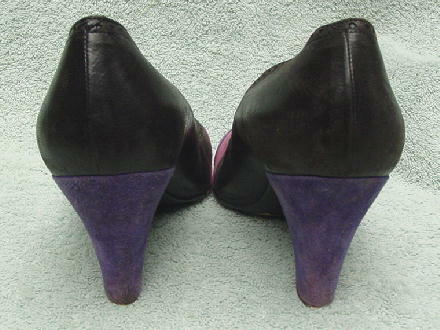 The heels and toe are light purple suede. Following the purple is a light magenta-wine suede. The rest of the shoe is in a very soft smooth black leather. There are decorative perforations along the top opening and on the toe suede areas. They have light tan leather linings and insoles and were made in Italy. They will need new heels, and the shoes have scuff marks. They're stamped 37, but they fit like a size 6. They were worn in a movie - the actress wore a size 6.